The art is in full view from just about every seat. In one of Provence’s most enchanted towns, St Paul de Vence, there is a charming stone hotel with a restaurant, La Colombe d’Or, that is more a museum than anything else. On the walls are paintings and drawings by the artists who lived and worked in southern France. Picasso, Matisse, Braque, Léger—they’re all there. It’s a place of great luxury and comfort, but it doesn’t feel stuffy or overbearing. For a few quietly thrilling hours, you can be in your own private museum. 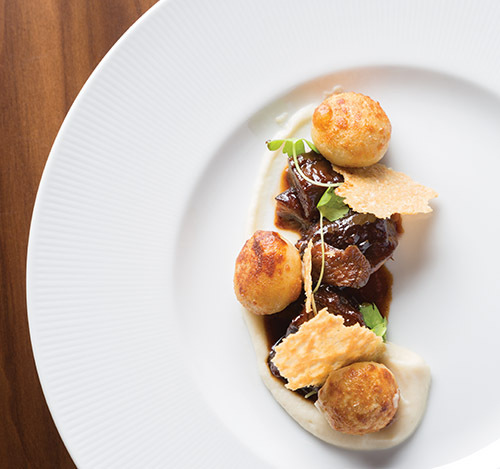 Atlas, in the St. Regis Atlanta in Buckhead, provides the same frisson. That head painted in oil, hung against lacquered wood-paneled walls, doesn’t just look like a Francis Bacon or a Lucian Freud—it is a Bacon or a Freud. That’s a Soutine oil behind the check stand. And van Gogh and Picasso and Chagall and Léger and Braque and Foujita and more, in two bays of the dining room, cozily massed with paintings and drawings by many of the past century’s leading artists—intimate works from the private collection of Joe Lewis, founder of Tavistock, which owns the St. Regis. 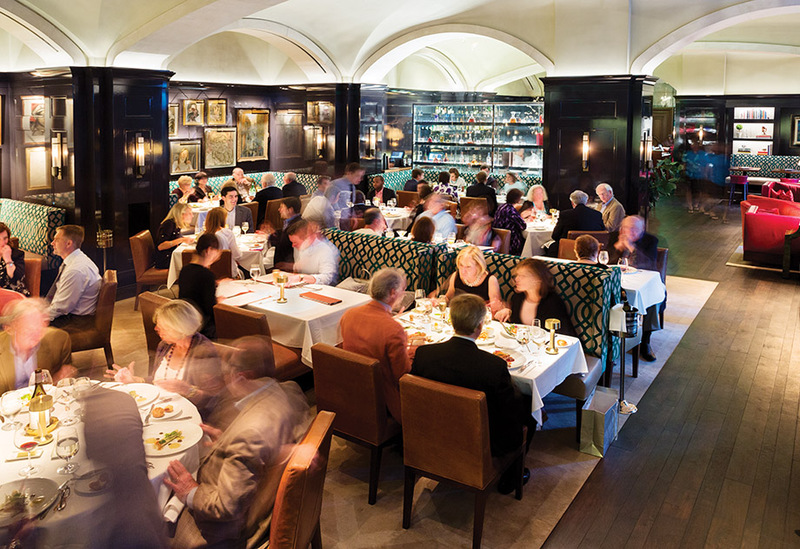 The chance to dine like modern royalty—waited on by attractive servers who manage to be attentive, alert, and friendly without being fawning—is a kind of gift to the city, the first luxurious hotel dining room since the Dining Room at the Ritz-Carlton, Buckhead fell victim to a crumbling economy in 2009. It’s not just the art that makes Atlas seem so extravagant; it’s the entire space. From the moment you open the wooden door with a big central brass knob, you enter a world of what Matisse might call luxe, calme, et volupté. Art books line shelves and cover coffee tables beside overstuffed sofas and chairs in an entryway bar room. Beneath a vaulted ceiling, arched mullioned windows and French doors open onto a courtyard with boxed hedges and flowers that make you think for a moment you might really be in Provence. The overall feel is so calming, the view through those high windows so bright and protected, that each time we were seated I felt we were on an indulgent vacation. Truffle pierogi with beef cheek. Why ask for the moon when we have the stars? That is: How’s the food? Fine. It’s nothing as memorable as the room and the service, or for that matter the long wine list. It’s also not the national innovation incubator that Guenter Seeger’s Ritz-Carlton was in its heyday. When dining at Atlas and speaking afterward with Christopher Grossman, the chef, I was completely convinced of the quality of the ingredients. Just as spring was underway, I admired the ivory and white of winter vegetables giving way to the yellow-green of new peas, fresh favas, and spring onions. Plates are prettily arranged; it’s a very good place to eat with your eyes. But with your palate? Not so much. Hard as I tried, and I tried hard, I couldn’t find much flavor in many of the artful plates. The first night I went, I had a cold, so assumed that the muted flavors simply reflected my blunted senses. Weeks later, I tried nearly every dish again and realized my cold hadn’t been so bad after all. However immaculately prepared and sensitively seasonal the ingredients, they didn’t seem fused by any guiding imagination. It’s hard to detect a vision or identity to the cuisine beyond opulence, which Atlas does very well. Like the servers, the cuisine speaks in a low voice and is very polite. But perfect manners don’t make for soulful food. They do make for very agreeable, and of course expensive, food. Grossman—who trained at Aria under Atlas’s consulting chef, Gerry Klaskala, and speaks of him as his mentor—cooks with effortless expertise. (After Aria, Grossman worked at the French Laundry.) A technically impressive main dish like perfectly tender slices of New Zealand venison tenderloin, accompanied by plum cherry puree and barley porridge with black truffle, was sophisticated and well-executed. But the cherries were neither particularly sweet nor sour from pickling, and the barley lacked the salt and chewiness to make it register. Two fish dishes were even more mysteriously fugitive in memory: sole with “spring succotash” and lobster nage, the pink sauce faintly buttery but so lightly lobster-flavored you’d never guess unless someone told you. The vegetables were distinguishable in the mouth only by texture. Halibut, a dense and snowywinter fish, was as meaty as it should be, but the acidic orange sauce and pine nuts with garbanzos seemed both under-flavored and miscalculated; nothing came together, and, even on a post-cold tasting, nothing stuck in my memory except for the sauce. A few dishes showed signs of personality. Potato pierogi dumplings, for example. On the menu, they appeared out of place beside the more expected fare, such as standard-issue butter-poached (bland) lobster with peas and asparagus, and (particularly flavorless) lightly cured yellowtail hiramasa. But the pierogi were chewy little flavor packages that, combined with marvelously braised beef cheeks, were probably the most satisfying dish on the menu. 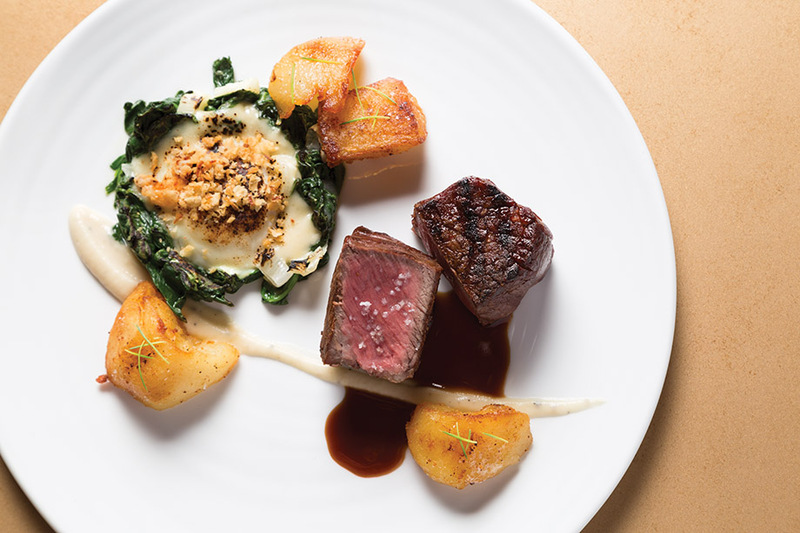 The most expensive main course ($59), a ribeye that is aged for 35 days, was another dish with character, thanks to the accompanying poached egg over spinach with Mornay sauce and home fries. Grossman described it as a cross between what he might cook on a Sunday (the fries) and a vision of creamed spinach he suspects he conjured from a teenage visit to Vienna. Whatever the inspiration, his high-low comfort hybrid is a success. The beef is both tender and slightly gamey, unlike the stringy yet more expensive dry-aged steaks I’ve tried lately; the corned tongue he strews on the plate adds a hash-house down-hominess that cuts through the studied elegance of the other mains. Best might have been the burger, at $25 the cheapest main course, impressive in its piece-by-piece reconstruction (ground wagyu and dry-age trim, “American” cheese made of Gouda and sharp cheddar). Salads were perkily fresh, particularly one of crunchy sunflower sprouts and pea shoots with buttermilk ricotta. A spring onion soup looked as creamy as the sieved potato-chicken stock velouté of a real vichyssoise but was nothing more, the chef swore, than a few Vidalia onions, spring onions, and Jerusalem artichokes for body. It takes real sophistication to conceive and present a dish so elegant, seasonal, and simple. 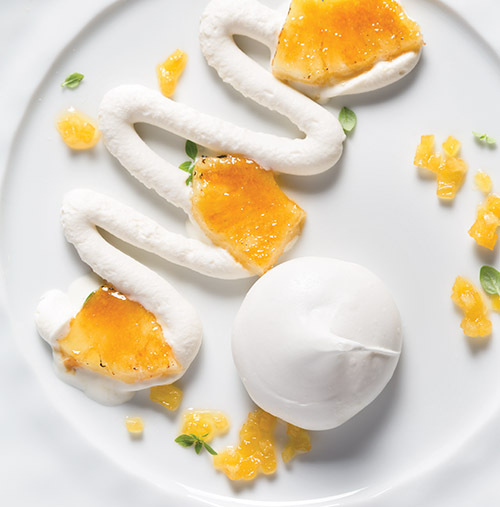 Desserts, by Judy Roman, are fairly elaborate and unexceptional, save for a passion fruit meringue with a sunny yellow, brightly acid passion fruit curd in the center—sweet, refreshing, marvelous. Which is why the minute anyone from out of town asks to go somewhere for a special occasion, preferably with me as a guest, I’ll say “Atlas” like a shot. It won’t be for the food. But a place that makes you feel the way Atlas does doesn’t need transcendent food. Like the mostly vanished great hotel restaurants, Atlas makes you feel cared for, refreshed, and, for just a few hours, transported to a lovelier world. Does food that’s just “fine” warrant three stars? It does in a dining room as beautiful as Atlas’s.